The New Interpreter's Bible brings the best in contemporary biblical scholarship into the service of the church to enhance preaching, teaching, and study of the Scriptures. Nearly 100 writers have prepared an entirely new collection of writings-an insightful commentary designed specifically as a tool for everyone who studies, preaches, and teaches Scripture-especially pastors, Sunday school and Bible school teachers, and interested laypersons. KEY FEATURES: Easy-to-use format-detailed, critical Commentary and Reflections (a detailed exposition growing directly out of the Commentary) Coverage of the entire Bible in twelve volumes-including the Apocryphal/Deuterocanonical books New material specifically prepared to meet the needs of today's preachers, teachers, and students of the Bible The biblical text is divided into coherent and natural units The ecumenical roster of contributors includes top scholars and emerging new voices who draw upon a variety of approaches Numerous visual aids (illustrations, maps, charts, timelines) enhance understanding and ease of use Introductions to each biblical book cover essential historical, literary, sociocultural, and theological issues The full texts and critical notes of the New International Version(r) and the New Revised Standard Version of the Bible are presented in parallel columns for quick reference and comparison. - Publisher New Interpreter's® Bible offers critically sound biblical interpretations for the 1990s and beyond. Guided by scholars, pastors, and laity representing diverse traditions, academic experience, and involvement in the Church, this entirely new collection of writings is specifically prepared to meet the needs of preachers, teachers, and all students of the Bible. Easy-to-use Format: * Full texts and critical notes: NIV and NRSV * A detailed, critical Commentary providing an exegetical "close-reading" of the biblical text * Reflections that present a detailed exposition of issues raised in the discussion and dealt with in the Commentary Key Features: * The entire Bible (including the Apocrypha Deuterocanonical books) in twelve volumes * Introductions to each book that cover essential historical, sociocultural, literary, and theological issues * An ecumenical roster of contributors * Comprehensive, concise articles * Numerous visual aids (illustrations, maps, charts, timelines) enhance use. 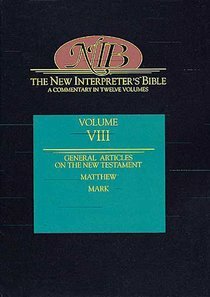 About "Matthew-Mark (#08 in New Interpreter's Bible Series)"
Leander E. Keck, convener of the Editorial Board and Senior New Testament Editor, is Winkley Professor Emeritus of Biblical Theology at Yale Divinity School.